I woke up Tuesday morning to a neighbor calling me on the phone and then knocking on my door to make sure I knew that tickets for Thom’s Sunday and Monday night shows at the Orpheum were going on sale that day. I thanked him, and let him know that I would not be going, due to my current financial situation. Discretionary spending is definitely as minimal as possible. Perhaps I will go and loiter outside the Orpheum instead, test if I can hear a thing, see if I can see anything before or after the show, catch a glimpse perhaps of the famous Thom. Sorry Thom, as much as I enjoy your music, and would love to see a show in the Orpheum, I can’t justify a $50 ticket. Eating is actually still in my budget. Maybe if I didn’t insist on eating? How true of a fan am I? Perhaps he will sing the below song, as tested at the Latitude Music Festival. Today, I was glancing through emails and saw mention of the Manimal Festival out at Pappy and Harriet’s in Pioneertown. Manimal is a record label, and they have many local artists on their label, who get a lot of airplay and promotion on KXLU (Loyola Marymount’s radio station) and are frequently seen at The Echo and other clubs I attend to hear music. The Manimal Festival? Who’s playing? And out jumps one of my favorite bands, recently seen at Sasquatch, Lollapalooza and Outside Lands: Other Lives. 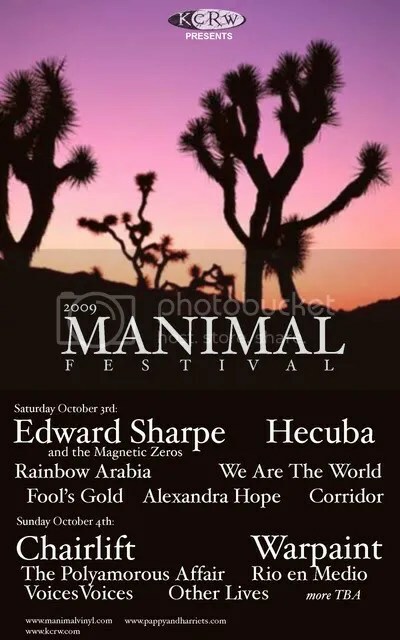 So of course I have to go check out the rest of the Manimal Festival lineup, see when the bands are playing and whether I can make it out to Pioneertown in the desert near Joshua Tree by the time my tutoring obligations are done. Other Lives are scheduled for 8 pm on Sunday, and I should be done with tutoring by 6:30 on Sunday. Ooh, tight. They’re only playing for an hour, and there are only a few more bands playing after them. And if there are any problems with parking, I’d miss them entirely…. I don’t know. $30 ticket for the day, regardless of what part of the day I show up. I am weighing the discretionary spending budget for the month in my head…. But just in finding the links to do this posting, I see on their MySpace page that their show has been cancelled. Yikes! Why is that? Turns out the lead singer Jesse Tabish is ill, possibly strep or mono, and definitely needs to rest. So no LA or Pioneertown shows. Bummer. However, the Manimal Festival website and affiliated sites announcing the show still have Other Lives listed, so good thing I found out before actually trying to make the trip. No discretionary spending needed. But in getting that far, looking at LA Record’s announcement of the lineup for the Manimal Festival and all, I find that Thom Yorke is doing a practice gig at the Echoplex (underneath The Echo) tonight, and they are selling tickets for that, starting today at noon. $20 to see a rehearsal with Thom Yorke and a band with as yet no name. The Echoplex is not a large space, so those tickets should sell out instantaneously. Good luck to all who try! Obviously not my photo, because you can bet I would mention running into Thom Yorke long enough to snap a photo! Spotted in in the parking lot of Pappy & Harriet’s in Pioneertown, CA, a high desert community near Joshua Tree/Palm Springs. Not to be confused with what I saw inside Pappy and Harriet’s. Dorothy, I don’t think we’re in Los Angeles anymore!